Casual jeans are worn on every moment and are very common among all around the world today. The formal jeans and designer jeans are no doubt in the wardrobe of everyone. A form of jeans which is similarly very famous among youngsters and models are the ripped jeans. Ripped jeans which are also well known as the destroyed jeans, torn jeans or distressed jeans are a fashion statement in the world of fashion. Distressed jeans have a shabby look indeed but the impact of being cool is so in the fashion. Dashing and cool image can be shown easily with the ripped torn or wrench and repaired jeans. Lat we have to look at the top collection of Distressed jeans for gents and ladies in fashion. Girls for those who wish to look cool and different can go for women ripped jeans that are shredded from the part of thighs to below knees. 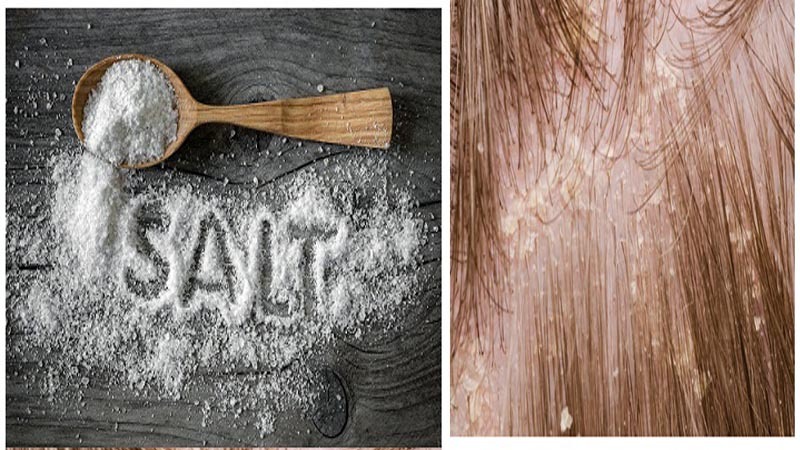 The tiny shreds look as if it has been scratched off or torn naturally. The worn out jeans also look such ripped one. Some seen skin part makes it look rougher to get the cool look. White shirts or short blouses look awesome with light blue torn jeans. A greater impact can be brought to your look with the wrapped up ripped jean. 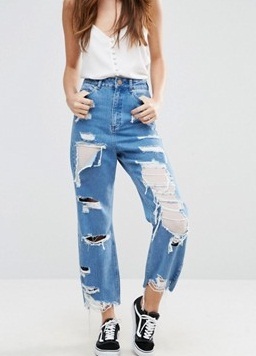 Women can wear such pair of jeans ripped in holes from different parts of the trousers. The holes can be stressed naturally showing the treads of the jeans fabric. The ends of the pants can be wrapped up to the ankle length so that it emphasizes more dashing. Summers can be made cool with the out ragging ripped jeans. Ripped and repaired jeans give a fantastic cool look as well. The patch work looks as if the torn areas are covered with different colored jeans. The chic look with such a pair of jeans can give you a trendy cool image. High boots can go well with the patched up ripped jeans. A cool image can be made with looking simple with ripped and patched up jeans. An inner patched up jeans a fantastic look of ripped jeans to get a rocky image. Women can wear such a pair of ripped and repaired jeans with a jeans jacket on a casual t-shirt. The sporty shoes and a cool image can be a perfect combination. DIY ideas can make your ripped jeans look more attractive. 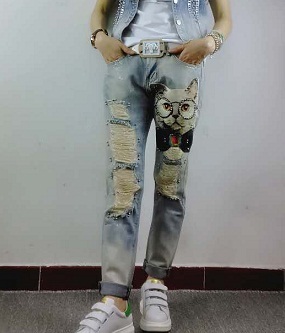 Painted images on the scratches of the jeans make it more attractively look different. 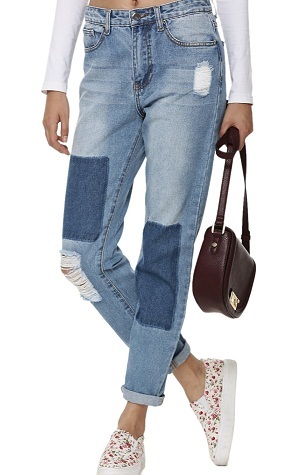 Baggy jeans are more comfortable in the collection of ripped jeans for women. Skinny ripped jeans are very hard and complicated while wearing. It may happen to wear the leg out of the holes of the ripped skinny jeans. Baggy ripped jeans can make you fit in comfortably and easily. Moving about is also easy in baggy jeans and the fear of ripped jeans getting more ripped off is less. Knee Black ripped jeans are designed for both men and women. Women prefer knee ripped jeans as there is less of torn part on the jeans and gives a ripped effect too. While there are women bold enough even to rip off the thigh and hips portion of the jeans. Some this jeans have huge holes surrounding almost more than the knee part. It is upon the choice of the wearer what suits them more. Men knee torn jeans are generally more on demand. The crazy look from the torn jeans give suits best for male attire. Boys are commonly seen in wrenched jeans because of their rough lifestyle. Compared to the girl’s lifestyle, ripped jeans look cool more on men. 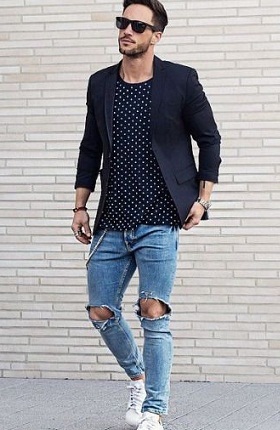 Knee ripped men jeans can be worn with cool dark shirt and a blazer to have cool look. 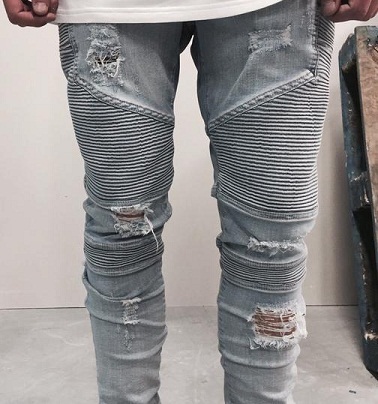 Straight legged ripped jeans for men are also with designer effect in them. Contrast color patch are seen from inside the jeans with the portion of the skin. 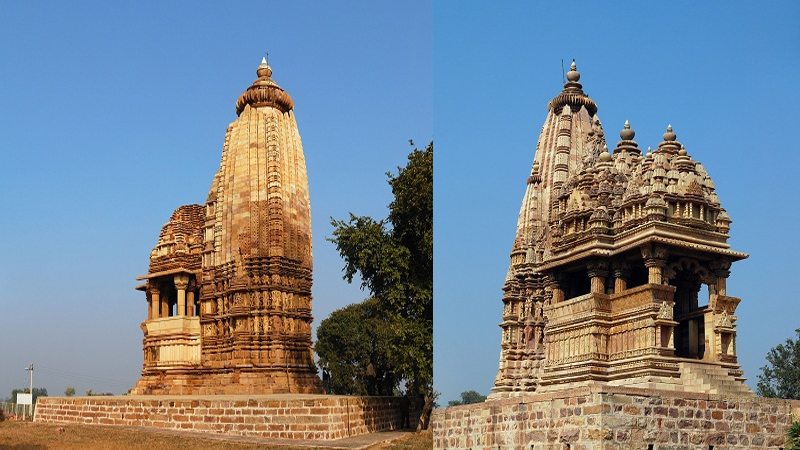 The designer effect gives more attraction due to the colored cloth peeping from inside. The chic cool look can be best for men with a muscle body. 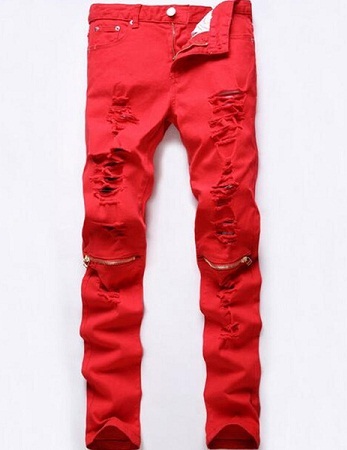 Designer ripped jeans for men are also in great demand to be one of the pieces in the wardrobe. 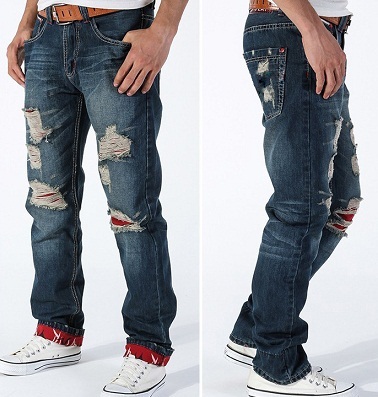 Slim fit blue jeans with scratches from the top thigh portion to the ankle give a spectacularly cool look. 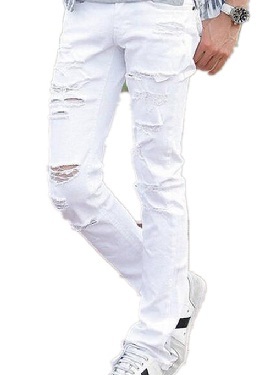 White ripped jeans are one of the designer jeans men and women would love to have for themselves. A designer white ripped jeans is sure not less in its value. And ripping off designer white jeans on our self is also not a cool job to do. White jeans particularly are worn very carefully for not having a stain on it. While a ripped of white jeans is costly to be owned. Vintage ripped jeans are on stylish destroyed jeans very much attractive and cool in looks. 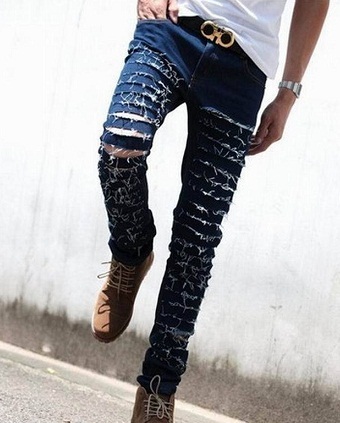 The male attire that is seen in these jeans make the men look strong and attractive. The shabby look of the vintage ripped jeans can be recognized with the dusty color and bleached stains on it. 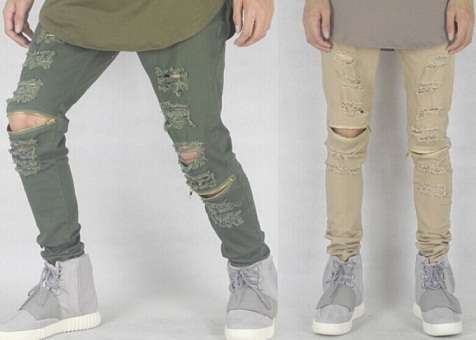 Colored ripped jeans are commonly worn by both men and women. The red color particularly is worn more. White shirts or tee’s are best suit in the red trousers with scratches and torn effects on them. High waist jeans for women are one designer jeans come in the ripped jeans form. Designer printed jeans with pattern of floral design or geometric designs have ripped of portions look trendy these days. 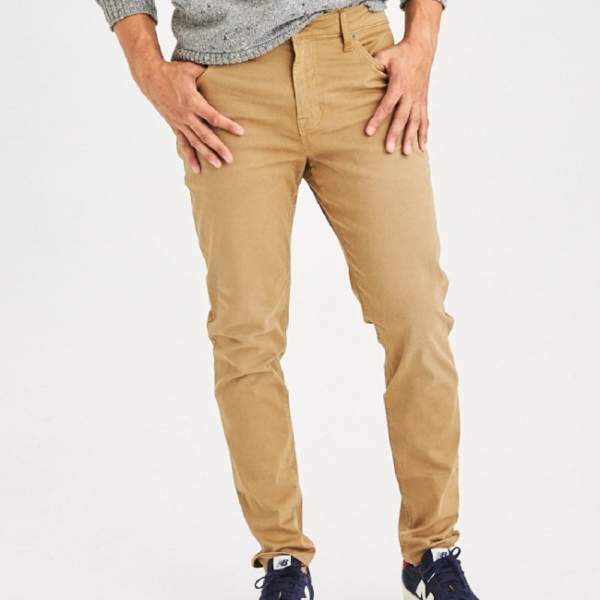 Designer slim fit jeans for men are with parts with designer looks on them. The patches torn out destroying the stitches of the jeans make it look cool. The pockets are seen attractively shown with stitched highlighted to be repaired. Somewhere it is also replaced with zips. 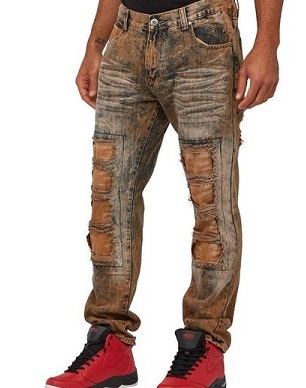 Sand color jeans with destroyed effect are a trend in ripped jeans. The sand color jeans come in many shades. Men and women both can wear such colors. A baggy shirt or t-shirt can look awesome on such jeans. When you want to look cool with ripped jeans and all, it is important to have proper accessories that go well with the image of being cool. A baggy shirt or a blazer, a long designer hand bag and pack booties for women can go great while men can choose knee length over coats, or jeans jackets, white skin tight shirts etc. one can choose according to his\her choice. Torn jeans come in many different designs. From bold to decent look torn jeans with fame can be your next look.